TOYOPEARL MegaCap II SP-550EC is a high capacity cation exchange resin optimized for the capture and purification of small proteins and peptides such as insulin. It is composed of polymethacrylate beads that have been functionalized with Sulfopropyl (SP) strong cation exchange groups. 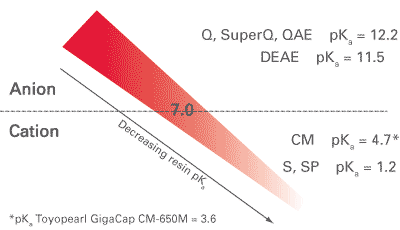 TOYOPEARL MegaCap II SP-550EC is available 200 µm particle size (EC-grade) and can be used for high throughput capture and intermediate purification process steps. It exhibits typical dynamic binding capacities of 130 g/L for insulin and maintains this high capacity at increased linear velocities.